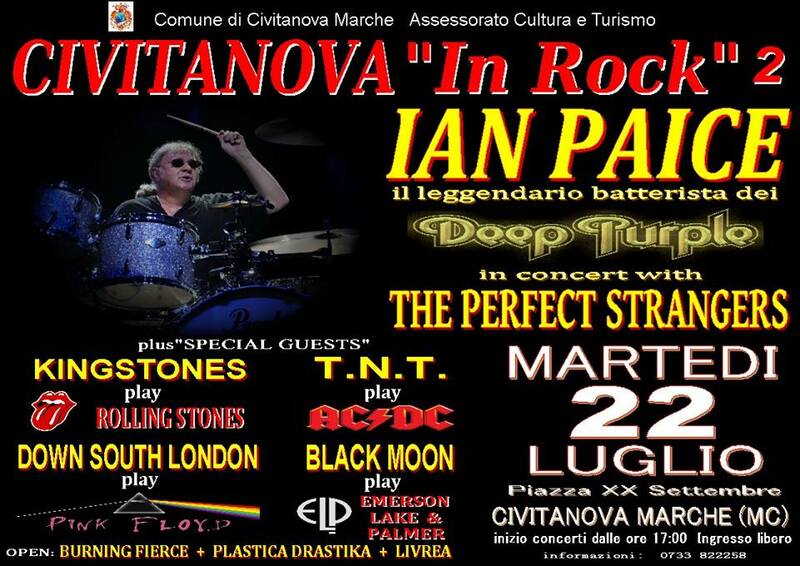 July 2014 • Ian Paice is doing another show with the tribute band The Perfect Strangers in Italy on July 22nd. Check out the flyer below for more details. Entry is free. 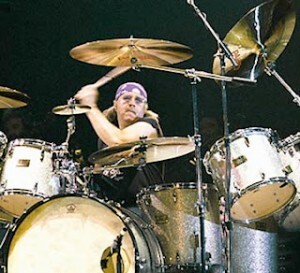 Ian Paice guests on Bernie Marsden’s upcoming album, see more on the David Coverdale page. 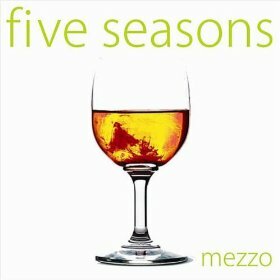 July 2013 • Max Sylvestre tells us Ian Paice drums on two tracks on the 4 track download EP, Five Seasons by Mezzo, shown below. It was recorded in April 2012 and released later that year. Musically it’s Italian’s having fun with a bit of seventies style rock, Hammond and all, and is pretty good except for the vocals which don’t really work for me. Anyway, here’s a link to some fixed camera footage of the band putting the track together with IP. Thanks also to Tim Summers. 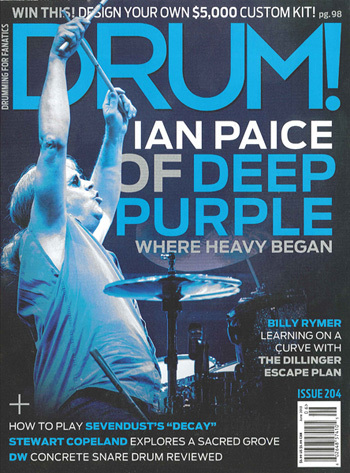 Hans Peter Jenssen sent us this new Ian Paice magazine cover. Inside, 8 pages of a long interview with history and anecdotes, and remarks about the new album. Nov 18. Paice has drummed on a track (Bargain) for a Who tribute album upcoming. Is he going for Glenn’s tribute album record?! Thanks to Vince Budd. Ian Paice was interviewed on Classic Rock Radio on Wednesday 12th September, talking about the forthcoming Sunflower Jam Charity Concert at the Royal Albert Hall London on the 16th of September. Ian also touches on the new Deep Purple studio album currently underway with Bob Ezrin producing. The whole piece lasts around 45 minutes with music, and you can hear it over the web on the station’s listen again feature. Took me ages to find this, so here’s the direct link – it’s at (or near) the top of the archive list. Sept 10. 2012 – The folk doing these limited edition Ian Paice signature kits have announced a price reduction, so if you were dithering, now might be a good time. Two of the four silver glitter kits have gone already. Ian Paice is on a forthcoming album of Nektar covers called ‘Spoonful of Time’. He’s on the track ‘For the Love of Money’ alongside John Whetton and Nik Turner. Thanks to Vince Budd. And no, they’re not strictly Kraut Rock – the band were English, but formed and lived and recorded in Germany. So honorary.